The only one I can think of is Family Guy... and it's about to come true! I can't wait. Lanikai, kahakai nani, aloha no au ia 'oe. A hui hou kakou. Family Guy - But as we all know it IS being revived. I'd like to see them revive full house... Except only keep the Olsen twins as far as the cast. Replace the rest of the cast with Jello and hot oil. Give me your tired, your poor, Your huddled masses yearning to breath free. The wretched refuse of your teeming shore. Send these, the homeless, tempest-tost to me. I bet you enjoyed Blossom too! Anyone for a Punky Bruster reunion? suddenly, your avatar is a little too well fitting. I bet you watch wrestling too, huh? Before enlightenment, chop wood, pour water, After enlightenment, chop wood, pour water. Man I saw reruns of that show on some cable channel about 2-3 months ago - all I can say is wow!!! Mass spectrometry... about the only thing in the world more expensive than reefkeeping. suddenly, your avatar is a little too well fitting. 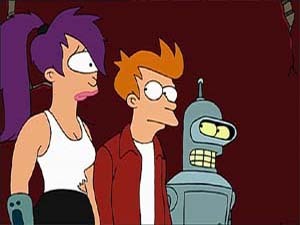 I used to like Futurama. A modern day Twilight Zone would be cool. HR Puffenstuff. Romper Room. The Courtship of Eddies Father. Speed Racer. I Tivo futurama and watch it everyday. The Six Million Dollar Man, with todays special effects it would be great. We watch Family guy and Futurama every night. If I can keep my eyes open, Aqua Teen hunger force too. Family guy is going to be directly opposite of desperate housewives, and I can't miss desperate housewives!! ooh ooh, can we get AJP to play Dano? my vote goes to battlestar galactica. I do not intend to tiptoe thru life only to arrive safely at death. Being dense here--who is AJP?